(NaturalNews) Vaccinations are created to help people develop immunity to disease, right? So why are more and more families reaching out and saying that vaccines are giving their children neurological damage and autism? 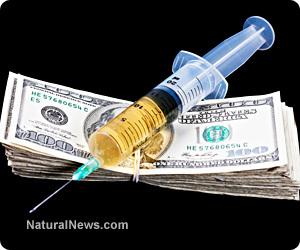 While investigating the vaccine industry, one might ask, "Are vaccines really keeping people immune from diseases, or are they actually inducing neurological damages by injecting heavy metals and other questionable ingredients into people's bloodstream?" And why are health risks ignored, unlabeled and not reported on? Who is really immune - those who consume vaccines, or the vaccine industry? Vaccine manufacturers themselves are the ones granted immunity, and it started in 1986 with the passage of the Childhood Vaccine Injury Act. It's time to take a closer look. In 1986, Congress passed a bill called the National Childhood Vaccine Injury Act. On the surface, this act looks judicial and compassionate - reaching out to injured families. What it really does though is circumvent the Constitution, denying injured parties the right to a trial by jury. In fact, this federal act allows vaccine manufacturers the "right" to not disclose known risks of their vaccinations. Based on the "learned intermediary doctrine," manufacturers of vaccines are immune from liability and don't have to report accurate information to those being vaccinated. According to this system, a family injured by a vaccine cannot sue the vaccine maker. Instead, the family must adhere to a specified federal claims court. This "vaccine court" shields the vaccine manufacturers from true judicial accountability, compensating victims by paying them off. This vaccine injury compensation program insulates vaccine manufacturers from liability, allowing them to keep operations steady, with affordable vaccine prices and a stable vaccine supply. This crony protection endorses bad medicine and keeps real immune system-boosting answers from ever entering the marketplace. It keeps people in the dark about vaccination dangers and spits right in the face of life, liberty and the pursuit of happiness in the United States of America. This is why vaccines are scheduled to children en masse today and are practically mandated. The list of vaccines given to children on the vaccine schedule has tripled in the last three decades! The whole circumventing process has basically bailed out the vaccine industry, allowing them to run free and have no consequences for harming other people's lives. Injured families are restricted from bringing vaccine manufacturer before a jury of their peers, so they must instead submit to the Department of Health and Human Services. The federal government then determines whether or not the family should be paid off to basically keep quiet. But victims are not keeping quiet, and groups like the Canary Party are raising awareness of this deceitful "vaccine court" system. "HHS has never concluded in any case that autism was caused by vaccination." But after reviewing "compensated cases of vaccine induced brain injury," there have been approximately 2,500 cases of vaccine injury privately compensated since 1986, and at least 83 of those cases were autism compensation cases. On top of that, since 2002, nearly 5,000 families have filed petitions with the VICP claiming that vaccines had caused their children's autism. But instead of holding manufacturers accountable, the VICP created and conducted the Omnibus Autism Proceeding. In 2010, all of these people's voices were drowned out, and their cases were consolidated into one case. The case was ultimately deemed a "test case" claim of vaccine-induced autism. Instead of receiving a trial by jury, each family was dismissed and disgraced. So do families have the right to a civil court? Do they have a right to bring vaccine manufacturers before a jury of their peers? Many believe this is their right under the Constitution of the United States.